Changing Times & The All Mighty Tortilla - Fueled by chile, frijoles & tortillas. Illustration by Luis Amendolla, for La Fonda Restaurant, Lafayette, La. So apparently making tortillas a mano isn’t what it used to be. At the very least it’s a dying art form in Hispanic kitchens across the country… or so it seems as fewer and fewer people are actually taking the time to make fresh tortillas, of any kind, from scratch on a regular basis. Hell, even in our ranchito in Mexico there’s a tortilla truck that drives around every day offering fresh handmade tortillas, made by someone else, for a couple of pesos. If you’re smart, and a little sneaky, nobody even has to know those tortillas you’re serving weren’t prepared by you! Growing up, though, we couldn’t sit down for one single meal without my mom making handmade tortillas de harina or the masa. Sometimes even both. Every day she would make a pile of flour tortillas for us kids and another pile of corn tortillas for her and my father. You could say we were spoiled. It’s okay. We’ll admit it. Our meals just weren’t meals without tortillas. In a lot of ways they still aren’t today! Only now we’re all okay with the store bought variety as well. Even mamá, while we were having this discussion at her house last night, had to admit that nowadays even she doesn’t feel like making tortillas all that often. It’s definitely a lot of work that requires mad skillz in the kitchen! Which made me recall something else tortilla-related: ¡tacos de sal! No meat. No pico. No guacamole. No lemon. No cheese. NO CHILE! Just a freshly made corn tortilla, slightly dampened with water, sprinkled with salt, squished together by bare hands to look like a small colorless churro. When money was tight that’s what we’d eat along with Quelite from our personal harvest of edible plants, built more out of necessity than personal choice. But it was better than having to string a single piece of meat through several tortillas to make the flavor last…which is what my parents had to do as children in each of their homes in Mexico when hunger was more abundant than the almighty peso. I guess in a way we were moving on up! From Wikipedia: According to Mayan legend, tortillas were invented by a peasant for his hungry king in ancient times. The first tortillas discovered, which date back to approximately 10,000 BC, were made of native maize with dried kernel. The Aztecs used a lot of maize, both eaten straight from the cob and in recipes. 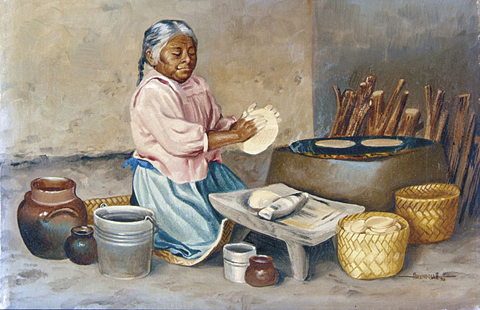 They ground the maize, and used the cornmeal to make a dough called masa. On 22 April 1519, Spaniards led by Hernán Cortés, also known as Hernando Cortez, arrived in what is now Mexico. They found that the inhabitants (Aztecs and other native Mexican peoples) made flat maize bread. The native Nahuatl name for this was tlaxcalli. This bread made from maize was later given the name tortilla (little cake) by the Spanish. For more on the tortilla visit Wikipedia. My mom still makes them a mano – but… the difference now is that she makes them for BRAGGING RIGHTS, not necessity. !Que madre, tengo! She loves the compliments she gets from her Italian-American & Polish-American & African-American friends. Same goes for much requested arroz mexicano and tamales. I have such fond memories of my grandmothers making tortillas and the way they tasted fresh off the comal (I won’t lie, I also liked tasting the masa still warm from their hands, too) but it seemed as I got older, everyone started using packaged tortillas. They’re not bad and have served us well, but now that I have a little boy I want him to have memories of “real” tortillas. I have started making flour tortillas using whole wheat and olive oil (gotta be healthy) and the more I make them the easier they are. I would like to make corn tortillas without having to depend on a package like maseca but I think that is entering a whole other realm of “homemade”. Hey Michelle, good for you! I know your son is going to appreciate that effort in the long run. I always remember my own mother’s tortillas with a lot of melancholy because it was one of the things we could always count on as kids. No matter how tough or rough things got, her tortillas were always there at the table when it was time to eat 🙂 About the corn tortillas, hey there is nothing wrong with using Maseca to help, jajaja! The niztamal is hard work! I actually just learned how to make tortillas and mow mi esposo will not have a meal without them. It reminds me of my grandma. My favorite tortilla food was tortilla with butter or tortilla with mustard.If I knew that peanut butter on a tortilla would be such a big hit, sheesh, I would have made them and sold them. Jessica, I love all those combinations… though my all time favorite is definitely tortilla de harina with butter, just warm enough where the butter slides onto the tortilla and melts! Those were delicious! In an effort to eat more healthy I started making my own whole wheat tortillas in January aand I am making them at least once a week- sometimes twice. Michelle is right, the more you make them the easier they are. I can whip them out in 10 minutes. The process even has taught me to make my own crackers…better than anything I can get in the market. The old ways are coming back! Thanks for the blog Juan! Wow, Arturo, good for you! Actually, learning how to make tortillas is one thing I would love to do! I need to really take time to have mi jefita show me how she makes the flour tortillas. Those are my favorites! Do you have a recipe you could share?? It is a lost art. Everyone in NM buys them now. Make them? My first and last attempt produced something akin to a matzo cracker, decades before I moved to Calif. and learned what that was. When I was a kid, living in Mexico, one of the children would go to the tortilleria every day to buy fresh corn tortillas. And we always scammed a few from the pack to each, rolled up hot and fresh, on our way home. My mother tells me that she didn’t know how to make tortillas when she married my Dad. He taught her. And she used to use a plate as a “pattern” and cut around it to make sure they came out round every time. jaja… the link between marriage and tortillas, that’s a whole other fun post 🙂 I admire your father, Sandra! I really would like to learn to make tortillas because it would be such an artwork to do so and to be able to then pass this part of our culture to the next generation. If they would have it of course, LOL!